As with most of my Japanese friends, I meet Koken-san through the Internet. He wrote an article for Headwaters magazine that I like and recently I realized we are friends on social media. For some time, I have wanted to take my Tenkara to the next level. Tenkara is a form of fixed line fly fishing in mountain streams yet now, as I learn more about all the different types of fixed line fishing, Tenkara becomes more specialized and less of a catch all term. In the latest issue of Headwaters, spring of 2016, I saw an article on two hand rods with floating fly lines for river trout, it sparked my interest. 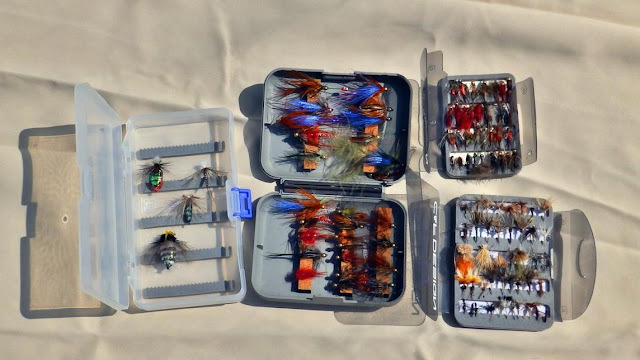 I have a long history of fly fishing in a big western river with extended dead drifting techniques. When I saw Koken Sorimachi’s article on 8m class two hand fixed fly line techniques, it resonated with me. Often I just figure things out on my own so I contacted Keiichi, we sourced a rod, I gathered my equipment and rigged it ready to go and I began studying two hand fixed line fishing. On a tangent, I have a large Japanese component to my Facebook news and little did I know, Koken-san and I are in the same friend circle. I had even contacted him previously! So I started another conversation on the two hand method asking him about equipment and doing an Interview here. Without spoiling our Interview, let’s begin. Adam: Koken-san, thank you very much for accepting my request for an Interview. I want to get deeply into our interests and I really appreciate your time and participation. Koken Sorimachi: Hello Mr. Adam. I am honored received the interview to you! Adam: I am an admirer of your fishing. So much so, you have created a new interest in me with your two hand fixed fly line fishing in large rivers. Recently, I bought an 8m Shimano bait rod and set up a couple of floating shooting/running lines for it at 9 and 11m lengths. I also have mini lead heads to get down where the fish are. I am very excited to use this new to me system. Koken Sorimachi: I applied 2-hand fly fishing style to a 2-hand Tenkara rod. Skagit spey casting and various casting etc, I did reference same for Tenkara of 2-hands including the casting style. Fixed line 2-hand Tenkara can operate a flow more precisely. Very natural and invites way. It is the rod which is effective when the width of a river is wide. I tried 7-10m length rod, weight is 200-330 g. I will feel that it is heavy weight rod first time. However, I do not have any problem if getting used and more. I felt that 8m was better balance. The line length total can cast as over 30m from this rod. But it is hard catch to fish on because there is not a reel. So 10-13m line was an ideal by the practice. Which one better line system? I will test many lines even now. Adam: For my “Tenkara” the rod length ends at about 4 or so meters. At that point the rod becomes a little too long for the stream and fish size. Tenkara for me is mountain stream fishing. I like to use as long of rod as possible and on some of my favorite streams, a rod of 3.3m is pretty long! On my nearest home stream, my favorite fly rod was a Sage 5’6” 3-weight. I could crouch under the first limbs of the trees along the stream and look back and thread my back cast into the hole and then forward cast very far with a tight loop. It was a great rod and I enjoyed developing my style with it. Now I only fish Tenkara. On the same stream, I use a triple zoom rod, the shortest at 2.7m and although it is nearly twice as long as my little fly rod, it still seems very short. But I would not choose a fly rod that length to fish the stream. The more I fish Tenkara, the less it becomes like fly fishing. It did not start out that way, I just adapted my fly fishing techniques to Tenkara then I stopped fly fishing and transitioned to Tenkara only. Maybe at some point in the future, I’ll start fly fishing again. 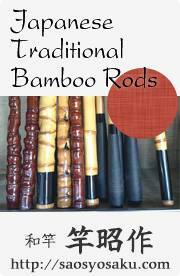 I have bamboo fly rods that I have made that call my name. But Tenkara works so well and fits my idea of fishing on a small stream. Koken Sorimachi: I am interested in all of the fish from the salt water to the fresh water. And I was fishing get a variety of fish . Among them, trout in particular is the best aim fish. The place where a trout lives of a headwater or main stream is wonderful. And I enjoy those fish with every style and do it. Fly fishing, Lure fishing, Live bait fishing and Tenkara. Those genres put it together in my head, and the design of the 2-hand rod began. Adam: I do some bait fishing, I have another Shimano bait rod, it is 6.1m and I use .8 mainline with yarn markers. In comparison, I used to do some spin fishing in streams and rivers a long time ago and I always thought that it was very stealthy but when I found out the Japanese methods of bait fishing, I think it is the most effective way to fish. It’s interesting yet I’m not interested in bait fishing as I am of Tenkara or fly fishing. Although bait fishing really catches a lot of fish, I like the idea of using feathers to catch fish. I’ve learned quite a bit about fishing from studying Japanese techniques. We have comparable fishing methods here yet the Japanese methods seem to have been perfected to an elevated degree. I have found that the Japanese fishers are people just like the rest of us yet they are very skilled in fishing. It’s much more engrained into your society than I understand in comparison with my own. Koken Sorimachi: Yes, I will research any fishing style for interest. In particular, fly and lure is allowed to heat up my mind . To resemble the real thing fly, or reflection eating . There are fun reasons . Live bait will invites even smell. The smell may not be necessary. In modern fishing, a decade in Japan, bait fishing was the main. It has become the main way to enjoy fishing to eat the fish in Japan. Adam: Over the years of my fly fishing, I studied books on entomology (insects) that where focus written by scientist fly fishers. The books are excellent and I learned quite a bit about the life cycle and habitat of insects that live in the stream. When I learned about Tenkara, there was very little written in Japanese about the imitation of insects with the kebari, most of the work is focused on presentation. I found out on my own practice that this is only a very small part of Japanese Tenkara. Here in America where many of us have taken up Tenkara; a large portion of us came to it from fly fishing background and some of us still “match the hatch” (using fly’s that closely imitate the insect) We use the rod to further imitate the behavior putting motion and or precise placement and movement on the fly. Koken Sorimachi: In Japan, there is a culture that eat the fish caught in river. I do not deny about it. But that angler is not a fisherman. I think that a study to come across each type of trout, that one is important. It is the quest of the one fishing rod, line, hook and more. I feel pleasure in my putting each style together, and going to the field. Adam: This next question may be hard to understand but I will try to explain further. 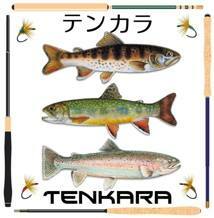 Tenkara is relatively new in America and I would go so far as saying it is new to the world of fishing too. Because it is so easy to learn Tenkara and be effective as a fisher, many people writing about it in social media. Fly fishing on the other hand is quite a bit more involved and it takes much longer to learn and get good at. The two groups meet in social media not always with good results. The fly fishers say that Tenkara is for people that just can’t learn to fly fish and the Tenkara people just talk to each other about how many fish they catch, normal argument stuff for enthusiasts of each style contrasting. The fact that new people catch a lot of fish is great. I like the results yet I understand the fly fisher’s view, they worked so hard to get good at it for so long. And now the Tenkara anglers catch catch catch and new people are skilled very quickly. I don’t like it that there is some friction between the two types of fishing groups. Ignorance is what it is and it runs through people, it takes people to empower ignorance, it’s a choice. 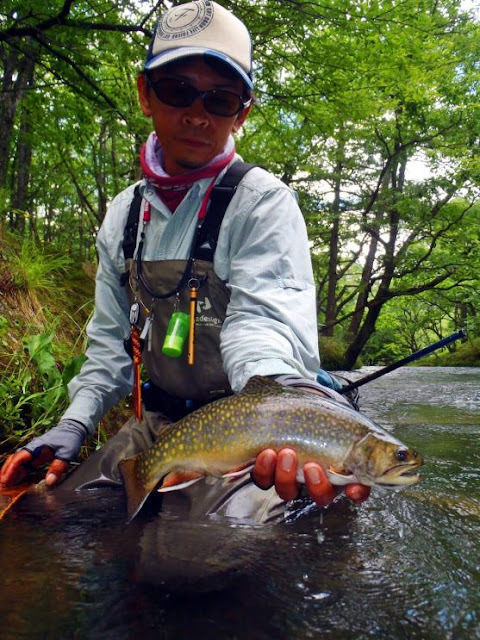 Koken Sorimachi: Only fly fishing and only Tenkara.There are a lot of people for only one style in Japan. No intersecting beyond its style. It is a good thing. However, it is also important to understand the different style. I think the new style is born to understand each. Now it has more anglers to understand the genre, such as social media . Adam: The Internet makes the world smaller for sure but I want to ask you about that. Let’s change gears a little bit. Koken Sorimachi: Yes, 2-hand Tenkara increased after a magazine was released. Of course, you also, had an interest in this style. I have thanks and respect to you. Adam: I fish (fly fish) the Colorado River in Marble Canyon, it is a huge western river. 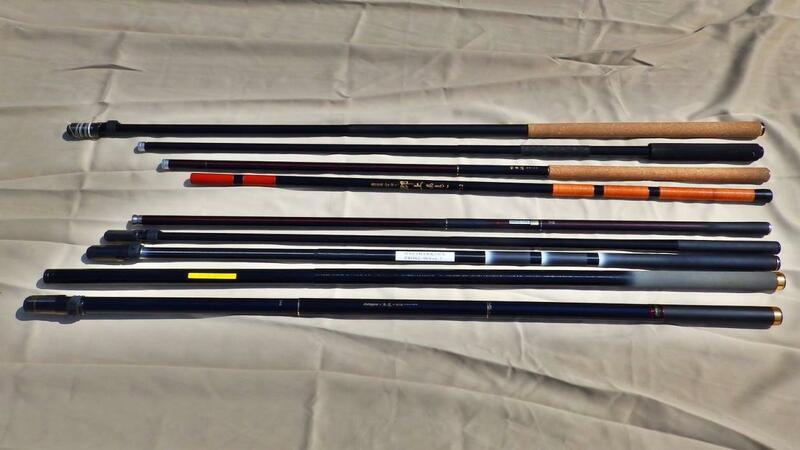 I use 3 to 7 weight 9 – 11’ fly rods with different types of rigging. Lines, like rods are a personalchoice. I like both a weight forward line for shooting distances and a double taper line for mending and durability. Even with the relatively short length of this system, there are certain things that come to mind that are repetitive and ergonomics to fishing this fly fishing system. “Throwing slack” to prevent the running line from dragging, using the rod to induce s-turns in the line, like a roll cast. “Strip set” will take up slack and set the hook much better, you do that by pulling on the line and sweeping the rod tip away from the direction of the fish. It really helps to quickly drive the hook home. There are a lot more of these terms or scenarios for instance but I bet you understand. 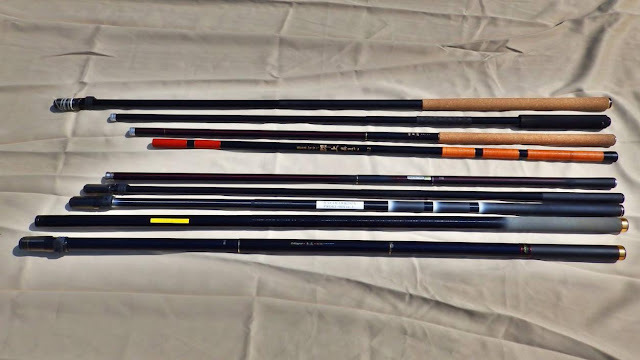 I have not used the 8m system enough to comment on the finer points of line handling or fish fighting but I can say that the rods are much easier to handle using techniques that manage the length of the rod while fishing and landing your catch. Koken Sorimachi: Line system has been trial and error. I think that it is to enjoy it to be important. It is slightly simple and it is slightly difficult. There is no decided style in Tenkara. They decide a style by oneself. I feel it to be with a pleasant point. I also used line same rod length. It is compatible with flexible because different depending on the scale of the river. Adam: Regarding 8m rods, can you describe the action of the rod that you like best for the techniques you are using with the lines that you choose? Koken Sorimachi: The rod and fish moves like a strut suspension of automobile, I think that it is ideal. Of course, Tenkara rod does not have a reel. Fish power must be received by the rod curve and anglers spirit. So operation of the rod bend and resistance is important. Also must be shooting the line for light weight stress-free. I sign on development with a Japanese fishing rods maker. Therefore I will make a trial product and repeat a field test to become the good product. 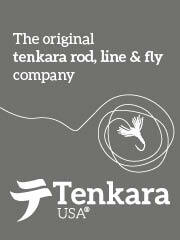 Has not been released yet completed 8m Tenkara rod. Adam: The long bait rods (5m and longer) are interesting, they are so long and petite and they are designed to be fished with light lines. The mainline they are designed for is small for those that don’t use them regularly, 5x or so. 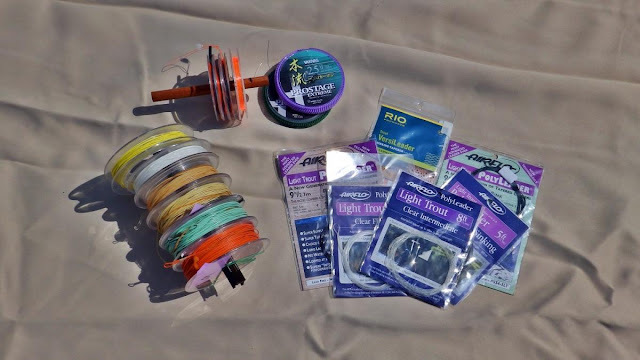 In your article, it appears that you use a floating fly line. Koken Sorimachi: 2 Hand Tenkara line uses the level line (running line) of a fly line. And I use monofilament fluorocarbon line and nylon line. I try any line, level line only and shooting head (Floating line, intermediate line, sinking line and fast sinking line). Which is the best choice? I will test it in river continuously. Adam: In America, Tenkara and Fixed line fishing with performance minded carbon fiber rods is relatively new. 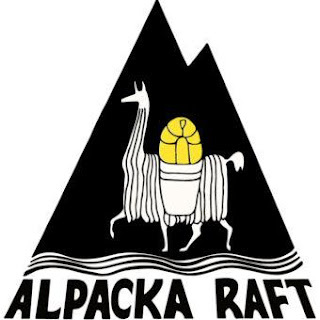 The earliest adopters started in 2009 with the introduction of Tenkara by Daniel Galhardo. We now have marketers and guides creating new sub-genres of Tenkara, “American Tenkara” which I find to be nothing more than Tenkara practiced by Americans. In your area (Japan) long rods and disciplines have emerged long before Tenkara was imported into America and now the world. Japanese anglers have practiced nearly all of the types and variations of fixed line fishing long before we have been doing it here. In America, we have a hybrid of practices and I would like to further compare. What flys (kebari) do you guys choose when fishing large rivers? Many of our fly names are unique but imitate an insect stage. We also have attractor patterns that do not imitate any one thing in particular. We have anglers that choose to use to minimize their fly choices and everything in between. “Do you have any thoughts on the comparison of the two regions? Is there anything in the Japanese media that reflects on the American presence of Tenkara fishermen? Koken Sorimachi: Fly for mainstream, I use the aquatic insect to imitate. And I use the color and shape to remodel to myself. It will invite a plus rod action. Currently Japan's trout has become smarter. They must have more realistic Fly, but I think originality is important. It is a greater impression. If trout was caught in ingenious fly. Adam: I tie my own kebari. It is something that I feel that I must do in order to be a complete fly fisherman. I have amassed quite a large collection of flys from many Tenkara anglers in Japan and in America. I can see the quintessential Tenkara fly is the Takayama Sakasa Kebari. It happens to be my goto fly when fishing Tenkara techniques. In rivers, there is a more specific food base than in small streams. Koken Sorimachi: The Japanese river is not large. Also anglers are always in the river. It is difficult to catch a fish with a decided style. I think about fly where I matched the bait or match the hatch. However, plus my originality fly is effective. Adam: I do a little salt water fly fishing. I am planning to take your system into the Sea of Cortez. My target specie will be Pompano and Sea Trout. Koken Sorimachi: I have tried 2-hand in the river mouth and a port. Small horse mackerel and perch can get. The system of the sea needs a more design in the future. Adam: In America, Tenkara continues to expand but it seems to have slowed down. Koken Sorimachi: Yes, Tenkara is slowly growing in Japan. Patagonia has proposed a simple Fly-Fishing. Also In Japan, has been attracting attention is Tenkara. Japan hiking became popular, together Tenkara rod in bag pack. Every people can enjoy the various style. 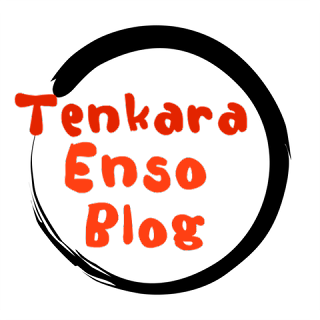 Fan of Tenkara hope that the increase in the future. Adam: I really want to thank you for answering my questions. I’m all rigged up now and will begin the new season with a rod and line system fashioned after yours. Koken Sorimachi: I experienced the field staff of various fishing rods development for a long time. I am focused on the rod to enjoy easy-to-use. The thing which adapted to the field is more important than catching fish. I have been to appeal in a magazine at the same time. Among them, I think that trout is a very valuable fish. So trout must be always in the near position from now on with us. Therefore, I am proposing the fun in fishing trout and anglers will encounter to forever. It Skagit cast was born in the Skagit River. Also There are fan of Skagit style in Japan. I hope to Tenkara of Japan felt to be known to United States in the same way.